I was thinking of the Lots project in terms of a conceptual shattering where the odd-size lots are like wedges within the social/communal landscape. Like weeds, the lots sprout up in the cracks between habitable plots. Invasive and pesky, they trip up the owners, creeping over perceived property lines and creating confusion over whose is whose and what is what. With the implication of growth within these patches of nature, I imagine their ability to break apart the city structure, slowly pulling at the seams until the fabric falls apart. The Lots project to me seems like a beautiful way to have these plots of land carry on Matta Clarks work in his absence. 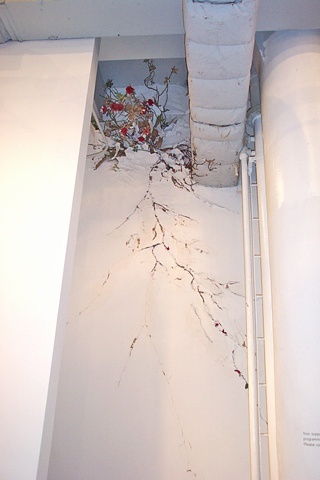 For this show, I conceived of a Rosebush growing through the wall. Poetic but thorny, it slowly tears a fissure in the architecture, opening the wall up to light and air. A domestic and romanticized plant with the ability to become wild, invasive and destructivethe Rosebush becomes part stand-in, part memorial, to Gordon Matta Clark.